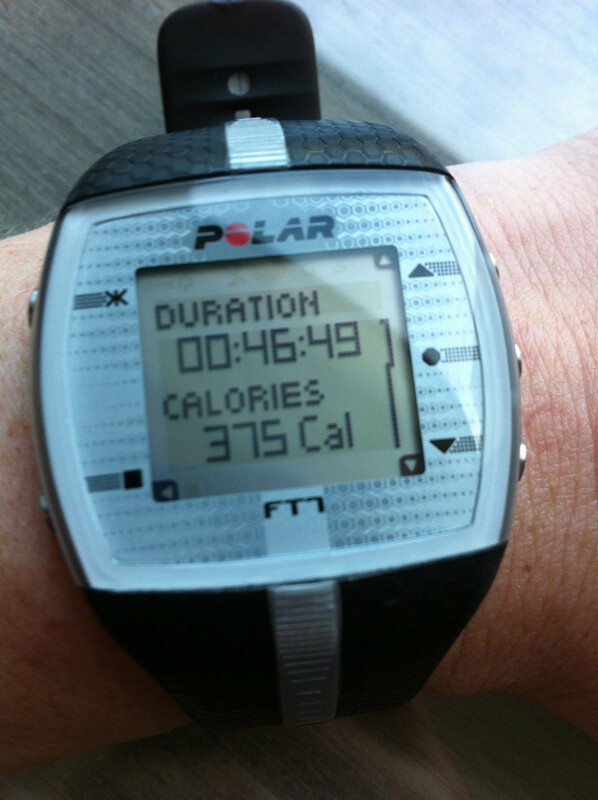 We flew into LA in the afternoon so I was able to get in my workout at home before we left. That was nice, getting it out of the way so I could enjoy some pizza for dinner! Vito’s Pizza We went here for a slice the first night we arrived. The pizza was supposedly very highly rated. 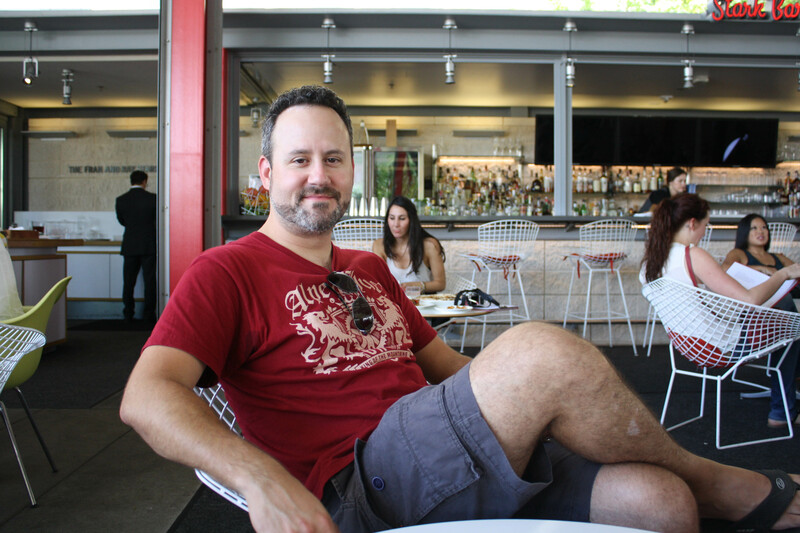 I didn’t like the vibe of the place, but the food was good. 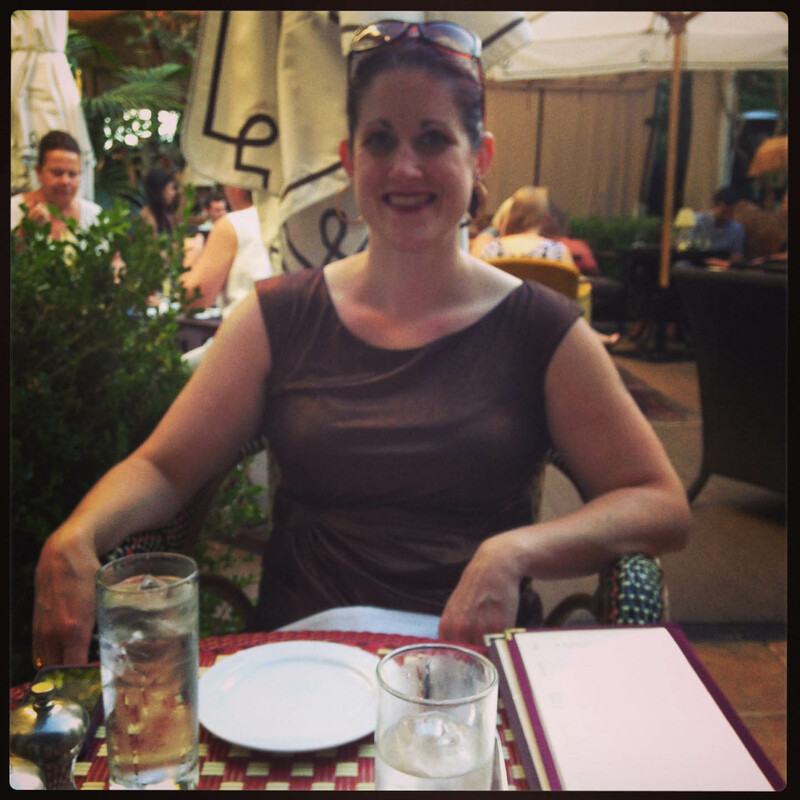 The restaurant was small, cramped, with limited seating options and it was in a strip mall. It seems like most of LA is in a strip mall…The pizza came out on a paper plate–again, lacking in atmosphere! But the pizza was decent. 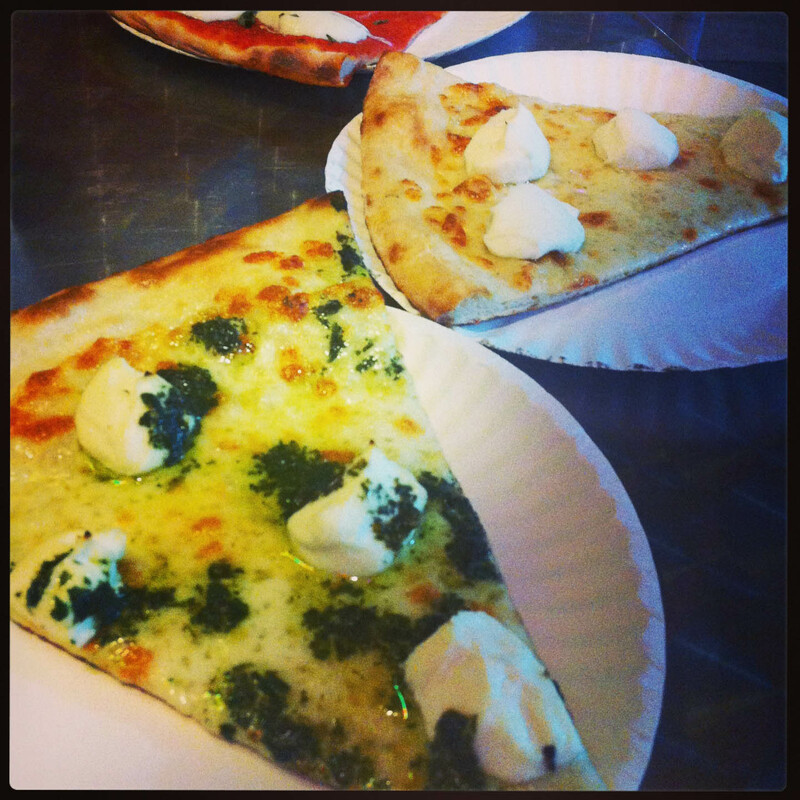 I got the white pie with pesto. What I thought were chunks of mozzarella cheese turned out to be ricotta. It was odd and new to me, but good. The only flaw is that they used a lot of ricotta cheese and it was really rich. The pesto helped balance out the sweet ricotta. 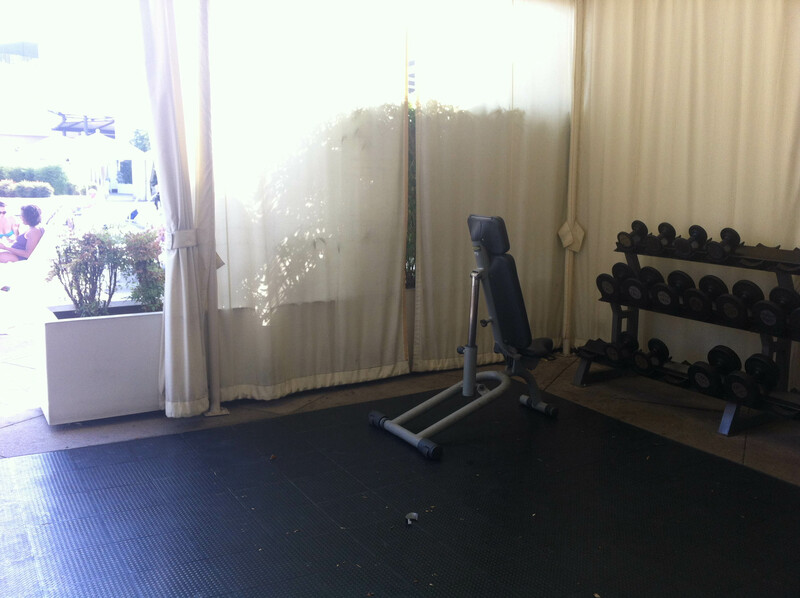 On Saturday I woke up a little early in order to enjoy the gym in the Loew’s Hollywood Hotel. It was such a cool gym! It wasn’t lame like a lot of hotel gyms. There were half a dozen treadmills, 4 ellipticals, a few bikes and the weight room was outside next to the pool. 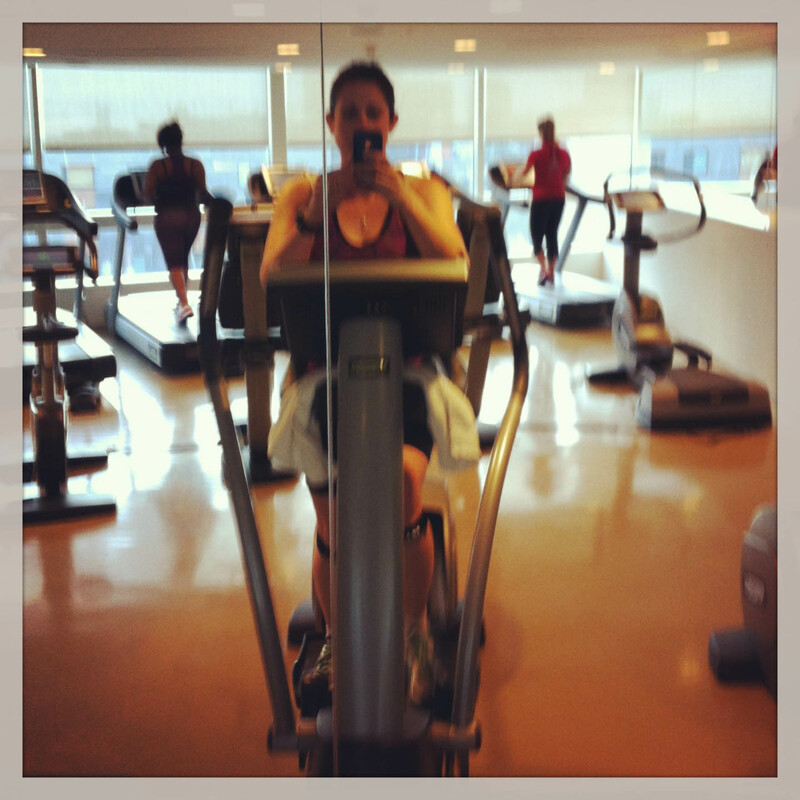 I worked out on the elliptical for about 20 minutes and then spent some time lifting weights. I had to modify my workout quite a bit because I didn’t have access to some of the things I needed for my program, but I still got in a good workout! On Sunday I went for a swim in the pool. I wanted to do more swimming on this trip but just didn’t get around to it. 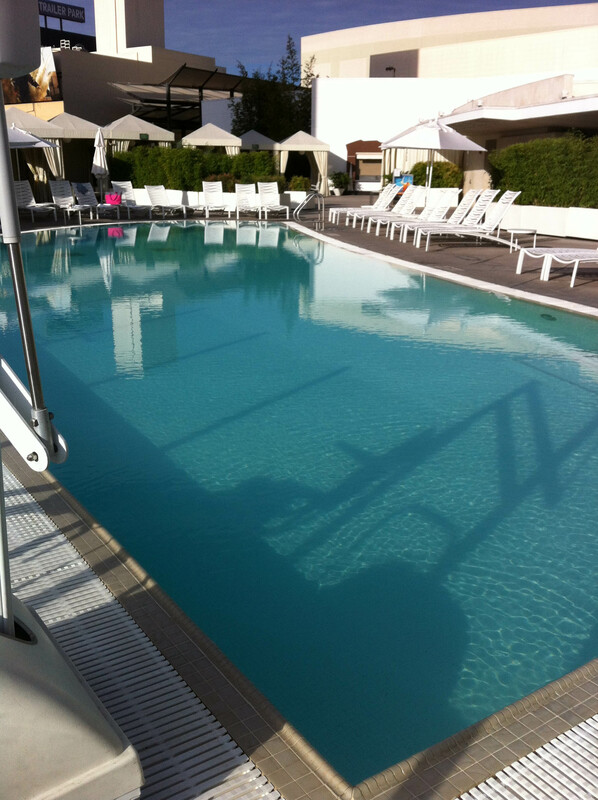 The pool was empty when I got there Sunday morning and was able to enjoy my swim with the pool all to myself. It was kind of a small pool for lap swimming but I made do. Then a guy joined me and decided to swim in a circle around the perimeter of the pool while I was trying to swim laps. I have no idea what he was thinking. 😛 It was very annoying. On Monday I took a rest day from the gym but ended up doing so much walking in Santa Monica that I definitely got a work out! The Abbey This place was such a cool find! It was such a cool building and huge! So much outdoor and indoor seating. 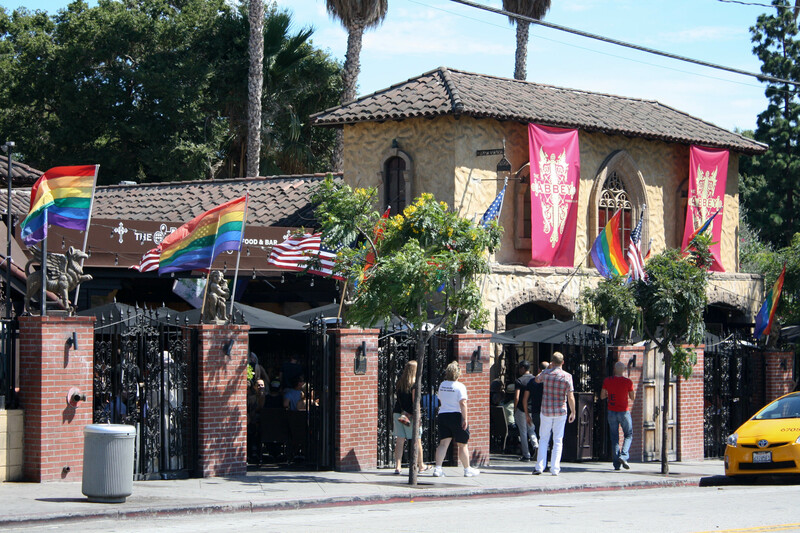 It’s a restaurant/gay club/bar/nightclub. We went here on a Sunday afternoon for a late lunch/snack and the place was completely packed. Not only that, there was a DJ spinning records. On a Sunday afternoon? Crazy! 25 Degrees We went here twice because the options near our hotel were so limited. First we went for happy hour. 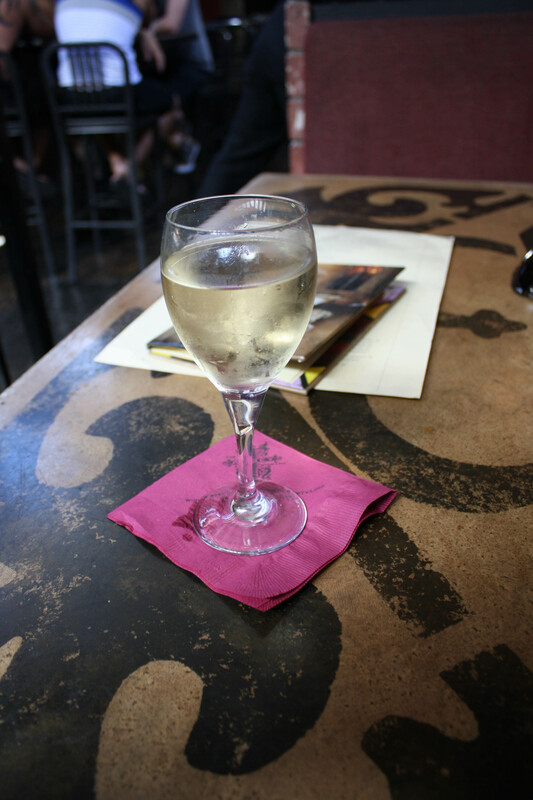 The drink options were decent and I loved the wine I got. 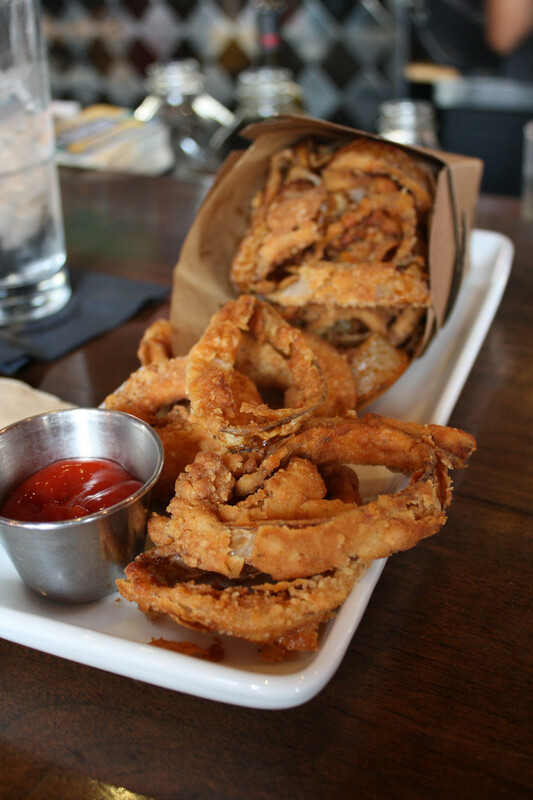 We shared an order of happy hour onion rings and Michael liked them a lot. I did not. The batter was odd in flavor and texture. The next day we got breakfast here. It was super spendy and honestly, overpriced for what we got, but the food was okay. This time Michael wasn’t impressed but I enjoyed breakfast. 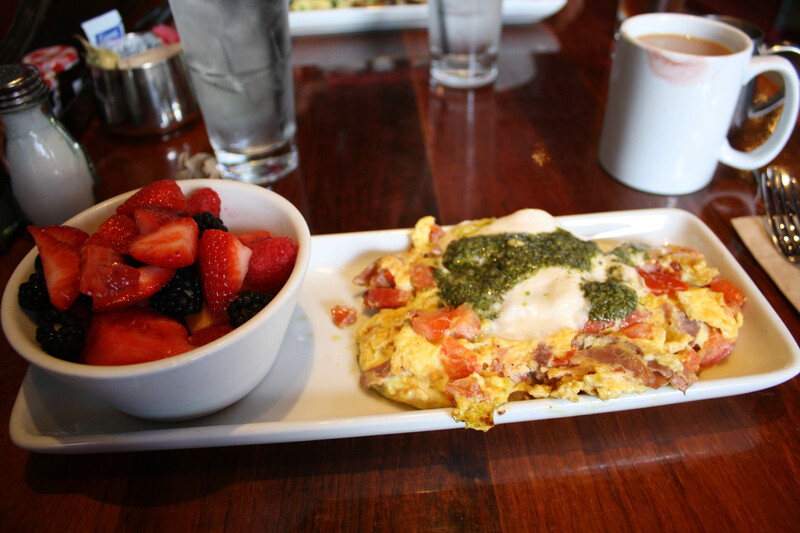 I got the scrambled eggs with burrata cheese, tomato, pesto and prosciutto. The dish was a little saltier than I prefer but it came with a big bowl of fresh fruit that was great. At the very least, go to The Roosevelt Hotel to check it out. The inside is amazing. We wanted to go to their bar for a drink but ran out of time. Ray’s and Stark Bar This was a nice discovery. It was a really hot day and we’d been outside seeing the sights and walking around the park for the La Brea Tar Pits for hours. This was much needed shade. The vibe was very cool and there was a nice breeze as we sat in the shade. Murakami Hollywood Hands down one of the best sushi dinners I’ve had, almost as good as the stuff we had in Hawaii. The reviews were raving and recommended the garlic soy sauce. Michael and I kind of mocked the people raving about it…I mean really, how good is garlic soy sauce? It’s pretty damn amazing we discovered! That sauce was fantastic. I don’t know how they made it but damn, I want more of that stuff. The fish was fresh and delicious. Michael got the spicy tuna bowl and I got the mixed sashimi salad combo that came with a specialty roll. The food was so good I wanted to go back the next day and eat it again! Chateau Marmont Hell yeah we went here! We actually went here for a drink and appetizer before going to the sushi restaurant for dinner. 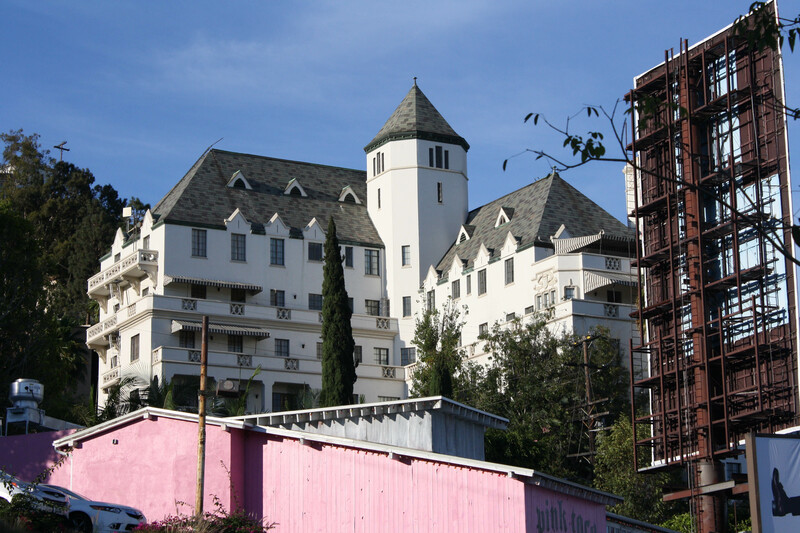 I’d wanted to go to the Chateau Marmont for years. It was so cool seeing it and enjoying a drink on the outside garden patio! 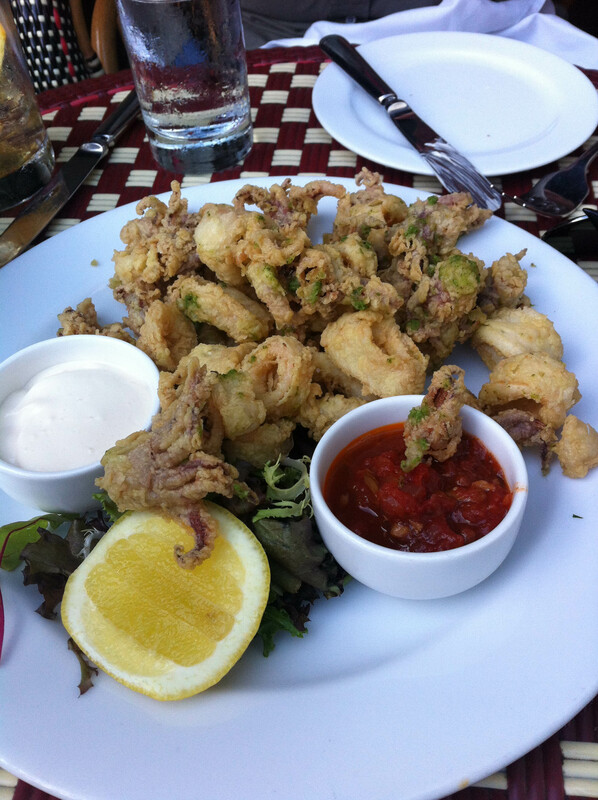 We shared an order of calamari at the restaurant and a drink. Cameras weren’t allowed, which I knew ahead of time but was still hoping to spot some celebrities and get photos! When we were leaving I saw Richard Lewis at the valet. He gave me THAT look–the one that says “I know you know who I am, but please don’t say anything or talk to me” look. LOL Whatever. It was still cool to see him! Animal style is where it’s at. It’s a good thing I don’t live in California because I’d eat here all the time. All. The. Time. I’m so glad we got to eat at some GOOD restaurants, slightly disappointed that we got burned at a few places. I guess I had high expectations for LA restaurants. I definitely ate more than normal and things I don’t normally eat. I’m glad we shared a lot of the meals we ordered–hopefully I didn’t do too much damage…But, the happy memories are worth it! QUESTION: Ever seen a celebrity in person? Glad you had a good time visiting my (sort of) neck of the woods! We’re about 80 minutes from LA, so we don’t go often, but planning a trip to hopefully visit the California Science Museum and also stop by Grill Em All for a burger afterwards. I just think it’s fun to see celebrities. Glad you enjoyed the hotel gym! We stayed at the Del Coronado on our honeymoon years ago, and I still dream about that gym. It was right on the beach, and I loved looking out when doing cardio. They also had water infused with fruit and fresh fruit. It was such a nice place to work out. The guy swimming in a circle sounds very annoying! Oh that gym sounds amazing!!! I would be dreaming about it, too. Yay In and Out!!!! I always wonder what people think when they have it for the first time. I imagined growing up with it you naturally love it, but it might not be great to someone else. Like White Castle, people are crazy for them back east but I think they are gross. Ah, I remember the smell so well. It’s so unfair we can’t get them up here! I had In-n-Out for the first time in Vegas years ago. Then again in Tucson and was like “WOW this is so good!” I hate fast food, but dang it’s good! Now whenever we travel somewhere that has it, we MUST go. I don’t think that area is especially known for the restaurants since it’s so touristy so it’s great that you got some good meals. I think there are much better restaurants west of there and all the way to the beach. Since I lived and worked there for so many years I saw tons of celebrities. Since I worked retail, I often had to assist them, which is always kinda odd but all good experiences for the most part. At least it gave me a legitimate excuse to interact with them which was nice. I’d get nervous at first and then I got pretty used to it. I wish we’d known that ahead of time, I might have planned a little differently. I’m glad I found some good restaurants that made up for the crappy food! The sushi salad looks delicious and the onion rings made my mouth water! 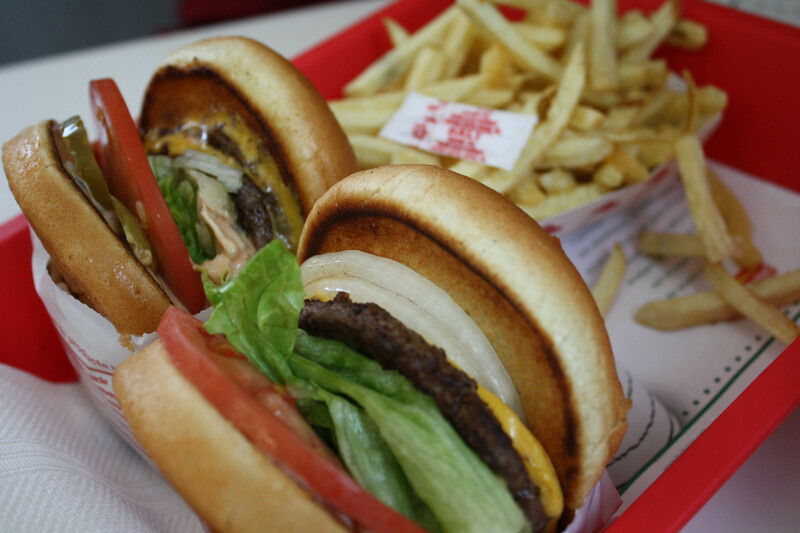 In-and-Out is unusually delicious for being just a fast food joint. Looks like you had good food while in LA! I’ve seen several celebs – Philip Michael Thomas (from Miami Vice), George Jones, Marian Ross, Vince Gill, Keith Urban, Ronny Dunn, Leigh Anne Womack, Martina McBride, and Raven Symone and her brother Blaize Pearman. All of them were in normal situations – eating, at the airport, out shopping, etc. I don’t bother them – I feel like if they are out doing normal stuff I should treat them as a normal person and not bother them. If they were at an event I would say something to them. I need to save this post. We will be in L.A. next month! Cool! What do you have planned already? While I was in LA they were filming NCIS LA and I saw Chris O’Donnell! The most famous person I have seen up close is the mother from Everybody Loves Raymond. She is so little! Our cousin works for Ryan Seacrest – and guess who was at their wedding? Yep – you guessed it. I was starstruck I have to admit. 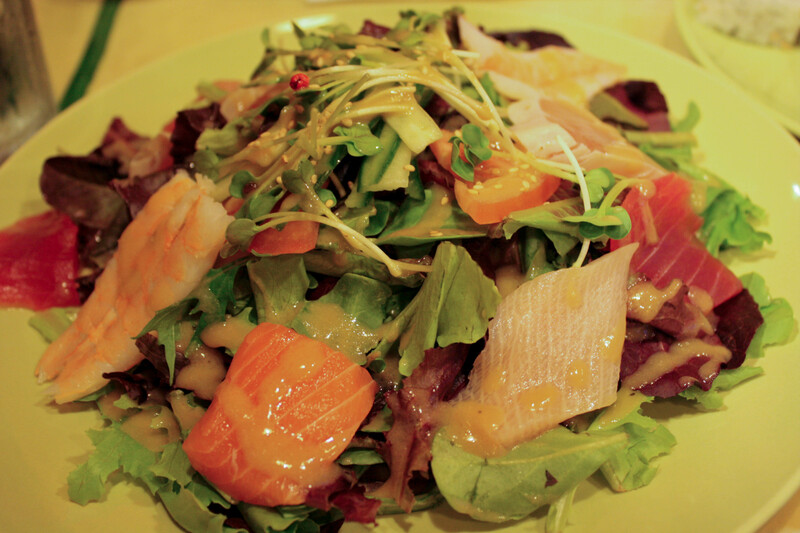 Your sashimi salad looks awesome – I wish I could get that here! It’s hard NOT to be a little starstruck. Even if you see someone you’re not particular a fan of. Them burgers look guuuuuuuuuuud. Glad you had fun. I’ve always wanted to try in n out!